Ben Huberman of the Daily Post invites us to “embrace the breathtakingly extravagant”, to show the opposite of ‘minimalist’ where “creators pulled no stops and went all out”. My second inspiration was the submission of Spirit in Politics whose photo shows the abundance of summer in a post entitled “Photo Challenge: Thy Eternal Summer”. I suggest you click his link and take a look at his photo. 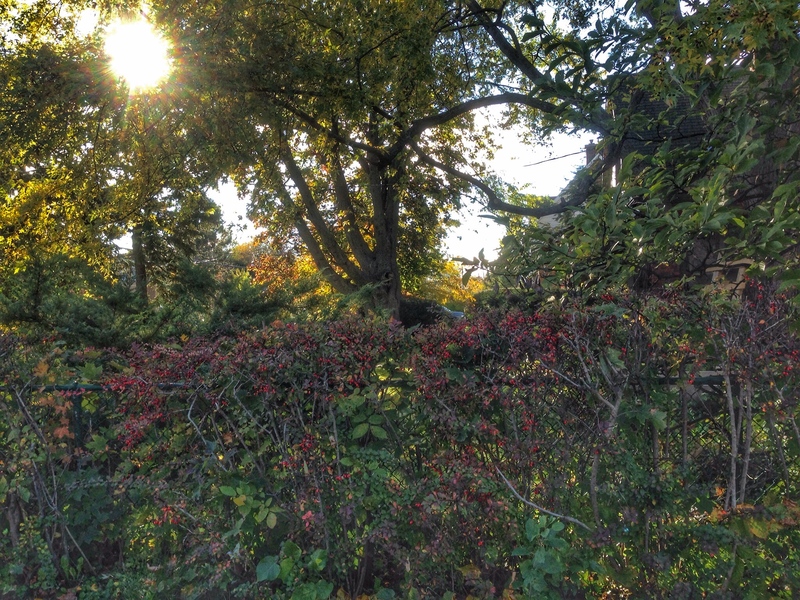 My photo, taken in October, shows nature’s extravagance: twisting vines, an abundance of red berries, a multi-trunked tree–growth and more growth. To see greater detail, please click on the picture. Friday Friends: It’s all about Expression, Connection, Fixation…and Love. glorious nature. as was your friend’s picture over at the spirit in politics. thank you! Nature is often ornately beautiful. Right now, that beauty is becoming more spare, but still to be enjoyed.